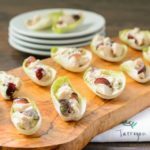 A recipe for chicken salad on endive spears. The chicken salad has walnuts, grapes, celery, and fresh tarragon. This is a great appetizer or salad for parties, showers, teas, and more. Preheat the oven to 375 degrees F. Rub the chicken breasts with olive oil and sprinkle with salt and pepper. Roast until the chicken is cooked through, about 40 minutes. Set aside to cool completely. You can do this step the day before and refrigerate the chicken overnight. Place the walnuts on a baking sheet and toast them in the oven for about 6 or 7 minutes. Set aside to cool. This step can also be done in advance. When the chicken is completely cooled, remove the meat from the bones. discard the skin and bones. Cut the chicken into small pieces and place the chicken in a large bowl. You should have about 3 1/2 to 4 cups of chicken. Add the walnuts, celery, shallot, grapes, and tarragon to the bowl. Season with salt and pepper. Stir ingredients together with as much mayonnaise as needed to desired level of creaminess. Cover mixture and refrigerate at least 1 hour for the flavors to blend together. Arrange the endive spears on a platter. Spoon the chicken salad onto the endive spears. Serve immediately. Refrigerate leftovers for up to 2 days. *Tarragon has a strong flavor and you can reduce the amount if desired.